 With the GOP® technology, images are analyzed and represented in different layers, from low level features to more high level features in an hierarchical structure. With three decades of experience in medical imaging, ContextVision continues to set new standards with the versatile GOP® technology at its core. The GOP technology involves a large set of contextual operations that can easily be cascaded. These contextual operations are based on consistent information representation computed from the image. The GOP representation is divided into a hierarchical computing structure, and filtering is performed with large and optimized filtering kernels. GOP is inspired by the human visual system in the way it finds information and analyzes structures. With this method, we can separate objects from background, based on texture. GOP is a versatile methodology for handling structured information and is a very advanced and efficient method for image processing. GOP® methodology is unique in detecting structures by examining the significance of each pixel in an image in relation to the wider context in which they appear. In this way, once the structure is identified and analyzed, noise can be suppressed, and the true structure – however weak – can be emphasized and seen more clearly.